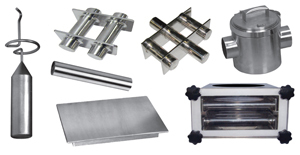 expanded its Value-Mag magnetic-separation product line to include magnetic cartridges, plate magnets, grate magnets, liquid line traps, two-drawer grate-in-housing magnets and sight-glass magnets. Beginning at 4 in. in length, magnetic cartridges are available in ceramic, Neo Power-Balanced and Neo High-Intensity magnetic strengths. Grate magnets, starting at 4 by 4 in., are offered in multiple sizes in ceramic and NPB.